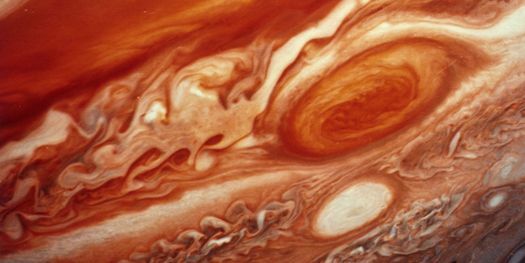 Scientists using the NASA/ESA Hubble Space Telescope have produced new maps of Jupiter that show the continuing changes in its famous Great Red Spot. The images also reveal a rare wave structure in the planet’s atmosphere that has not been seen for decades. The new image is the first in a series of annual portraits of the Solar System’s outer planets, which will give us new glimpses of these remote worlds, and help scientists to study how they change over time. In this new image of Jupiter a broad range of features has been captured, including winds, clouds and storms. The scientists behind the new images took pictures of Jupiter using Hubble’s Wide Field Camera 3 over a ten-hour period and have produced two maps of the entire planet from the observations. These maps make it possible to determine the speeds of Jupiter’s winds, to identify different phenomena in its atmosphere and to track changes in its most famous features. This entry was posted in Space/Galaxy and tagged Great Red Spot, jupiter, NASA/ESA Hubble Space Telescope. Bookmark the permalink.